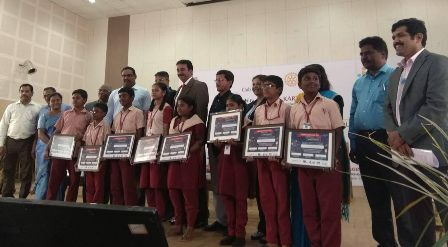 The Rotary Club of Madras East in association with Greater Chennai Corporation organized the third edition of “Wings to Fly”- Elocution Competition, exclusively for Corporation School Students. The prize distribution was held at Amma Arangam, Shenoy Nagar where Dr. D. Karthikeyan IAS, Commissioner and Ms. Mageswari Ravikumar IAS, Deputy Commissioner (Education), Greater Chennai Corporation distributed the prizes to the winners. 8 students from different corporation schools will go to NASA, USA on a sponsored trip put together by the Rotary Club of Madras East Rtn. Magesh Pattabhiraman, Chairman, Wings to Fly said it was a very emotional moment for the winners and also all others who were delighted and surprised at the fact that they 8 of them will be going abroad for the first time in their life. Rtn. BS Purshotham, President, RCME, said “Wings To Fly is a project, initiated 3 years ago by the Rotary Club of Madras East, which was planned with the Chennai Corporation school children in mind. The purpose of this project is to attract the attention of children and for them to understand that, there is a much larger and bigger world available out there, full of opportunities for them. The competition saw a huge participation of 3000 students during the screening rounds. Senior management professionals from IIT, Chennai, Corporates like Rane Madras Ltd., colleges professors and Rotarians were the judges for the show.